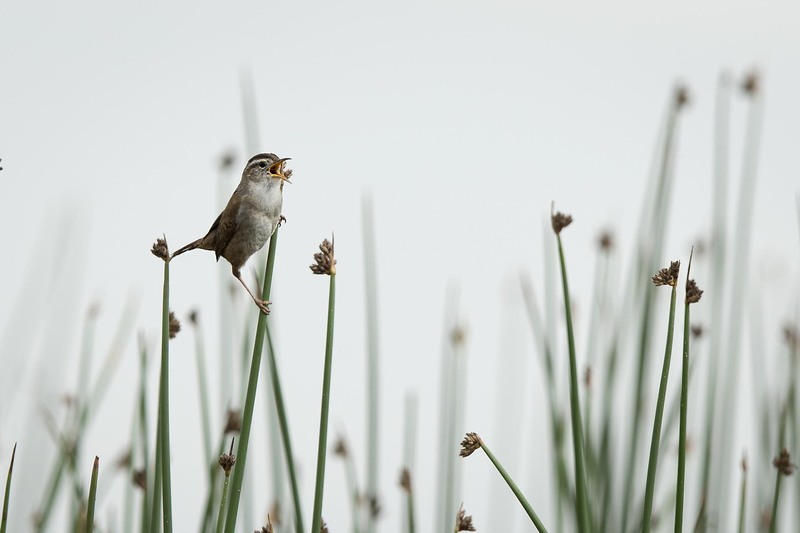 A tiny marsh wren belting out a little tune on an overcast day in the Arapahoe National Wildlife refuge near Walden, CO. It is amazing that such a huge song ca come out of such a little body. Take care. Perfect image, Mike. I feel like I was there. I love the way the birds put their whole hearts and souls into their songs. Yes, you can really fell that effort these little wrens put into their songs. Darting into the reeds between efforts to catch a rest. Hope you are having a great day. Thanks, hope your day is going great. Indeed a mighty effort from these little guys. Great capture. The bird looks so full of life. Hi and thanks, these guys do put their all into their songs. Hope you are having a great day. A cute little guy for sure. Hope you are doing well and having a great week. Delightful capture, Mike! Hope your weekend is a good one. Hi Eliza, so far the week is OK albeit a bit on the busy side. Thanks, hope you are doing great and having a great day. The marsh wren is one of my favorite birds. So sassy! This picture really captures their feisty attitude. Hi Kit, yes tis guys was busy darting into and out of the reeds with abandon singing away then back to the reeds for a minute or two to recover from the effort. Hope you are having a great day. Wonderful! Such a minimalist looking image! Difficult to do with a subject like this. Well done. Thanks Mike and glad you like the look of the image. I had second thought about the presentation and not cropping in more on the bird but this is really how it felt out in the marsh so I cropped it this way. Thanks again and I hope your day is going well. This is a gorgeous picture, I really, really like it. Thanks Jenny, hope you are having a wonderful day. Lovely photo of this singing bird. Thanks Bente, cute little guy with a mighty song. Thanks for the feedback and wishing you a great week. Thanks Margaret, hope you have a great weekend. Thanks and thanks for taking time to leave us some feedback as we really appreciate it. Sorry we were slow to respond but we were off-line for a few weeks. It’s all been said but I just have to add: I love it too. Thanks Mary, it’s always fun to watch and listen to this elusive little wrens.